Adobe InCopy is a professional word processor made by Adobe Systems. It integrates with Adobe InDesign. InDesign is used to publish printed material, including newspapers and magazines, whereas InCopy is used for general word processing. The software enables editors to write, edit, and design documents. The software includes standard word processing features such as spell check, track changes, and word count, and has various viewing modes that allow editors to visually inspect design elements — just as it looks to the designer working in Adobe InDesign. Version 3.0 of InCopy was included in the first Adobe Creative Suite in 2003, and later versions were included in versions of the Creative Suite up until version CS6. From 2013 newer versions are only available on the Adobe Creative Cloud. InCopy has three viewing modes: Story mode, galley mode and layout mode. The story mode is for reading and editing text in a screen-wide view without page formatting. The galley mode displays text without page formatting but with line numbers and the same line breaks seen in the layout mode. Both galley and story views show the names of the style sheets applied to the text but do not display the actual formatting. The layout mode shows the true page design layout along with images and overset text. Although InCopy can be used as a word processor (with full printing and exporting functions), it is primarily used to integrate with Adobe InDesign. Once integrated, writers, editors and designers can simultaneously work on the same page; the designer creates the page layout with InDesign, while editors simultaneously edit different stories with InCopy, via the Adobe LiveEdit rights management system. Publishers often use a publishing system including workflow- and rights-management to the design and editing capabilities of the publishing system software. Bi-directional text flow: The notion of right-to-left behavior applies to several objects: Story, paragraph, character and table. Right-to-left and left-to-right content can be mixed. Dictionary and hyphenation module: Includes a dictionary for Hebrew or Arabic for spelling check, with a choice of rules, like strict alef hamza, strict final yāʾ, both or none. Enhanced font support: Supports most fonts shipped with the OS as well as a large number of third-party fonts. Search and replace: It is possible to search and change specific occurrences of Middle Eastern characters, words, groups of words, or text formatted a certain way across a selection, one or more stories, a document, or multiple open documents. Searching for OpenType attributes such as fractions and swashes is also supported. Importing and exporting: Can import QuarkXPress files, even using Arabic XT, Arabic Phonyx or Hebrew QXPressWay fonts, retaining the layout and content. Includes 50 import and export filters. ^ "Meeting Notes Archive". Chicago InDesign User Group. 4 May 2004. Retrieved 10 September 2014. ^ Cow News Droid (28 October 2003). "Adobe InCopy CS Now Shipping". Retrieved 10 September 2014. ^ "Downloads: InCopy for Windows". 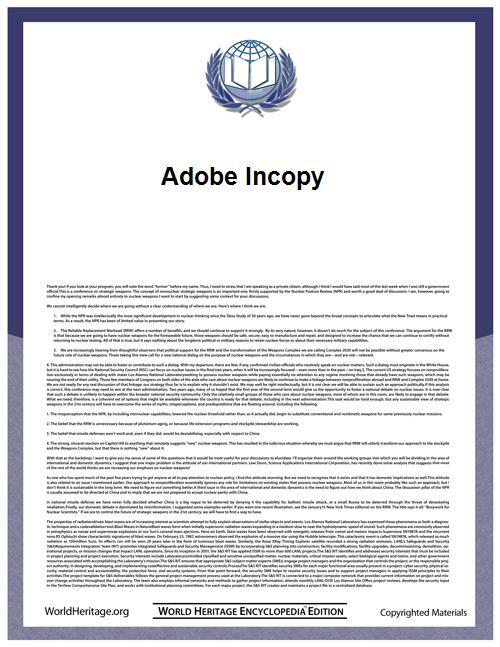 ^ "Adobe InCopy CS" (PDF).